Capturing A World Ltd is an aerial imaging company, we utilise both fixed wing and multirotor remotely piloted aircraft systems (RPAS), equipped with RGB and Multispectral cameras to carry out mapping missions for crop health, stockpile calculations, damage assessment, archaeological investigation and 3D modelling. We hold an aerial works permit from the Irish Aviation Authority (IAA) and are fully insured. For 2016 we plan to achieve our permit for aerial work from the UK’s Civil Aviation Authority (CAA) to allow us to cover the whole of the island of Ireland. We differ in our use of the two types of RPAS, fixed wing and multirotor. By using fixed wing autonomous aircraft with a flight time of up to 45 minutes we can cover large areas of land in an accurate and rapid method. In this time our Sensefly eBee can cover approximately 108 acres (44 hectares) to a ground sampling rate of 3.4cm/pixel with our RGB camera. The limit of the area is confined by the current IAA regulations that restricts us to flying no further than 500m from the pilot, the aircraft itself has a lateral range of 2000m from the pilot. We also use a multispectral sensor developed by Airinov in France, this sensor uses four separate cameras to take simultaneous images. Each camera captures a specific wavelength with no spectral cross-over, (550nm – Green / 660nm – Red / 735nm – Red Edge / 79nm – Near Infra-red), making it ideal for agricultural indexing. The images from the cameras are processed in Pix4D, a photogrammetry software package developed in Switzerland. The software calculates the position of each of the images and generates both a 3D point cloud of the area, but also looks at the individual pixels within the images from each of the multispectral cameras. Interpretation of this data by agricultural indexing can show crop health and stress. We also use a DJI S1000+ octocopter with either a Sony A7R or Sony A7S full frame camera, with the A7R this gives us 36MP resolution of images, with the A7S connected through an Atomos Shogun generates lossless 4K resolution videos. Our octocopter can also be used to enhance the output from the eBee by combining the image datasets in Pix4D. Aerial mapping and imaging by RPAS is a fast moving sector. The availability and functionality of the systems has changed significantly, predictions in the market are that 40% of future RPAS usage will be in the agricultural sector. 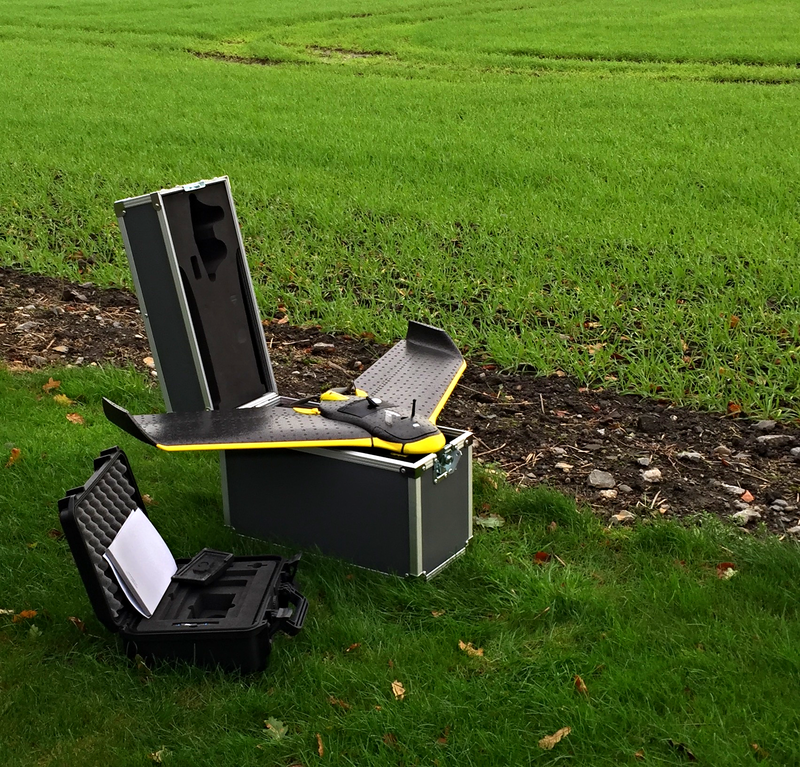 With our Sensefly eBee we are at the beginning of this change in technology for agricultural use. By collaborative research with universities into the specific agricultural indices that can be generated by RPAS we will be able to determine early signs of stress and disease in plants. 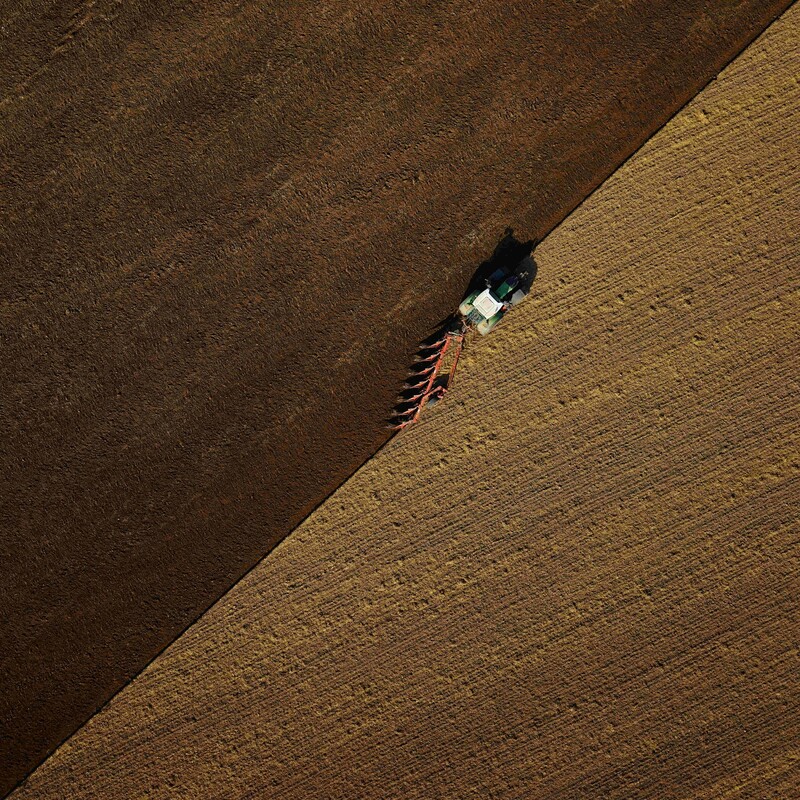 This ability to monitor crops from the air, diagnose problem areas in the field or forest, allow the farmer/forester to take action in specific areas only will thereby reduce the requirement for input in terms of pesticides / fertilizer, reducing the impact on the environment and more immediate to clients the cost of production. The use of our fixed wing aircraft gives us an advantage of area coverage. With only one propeller on the aircraft the battery is smaller and lighter than those used in the multirotor aircraft, the 2159mAH battery gives up to 45 minutes of flight, compared with our DJI S1000+ that uses up its 23000mAH in 16 minutes. 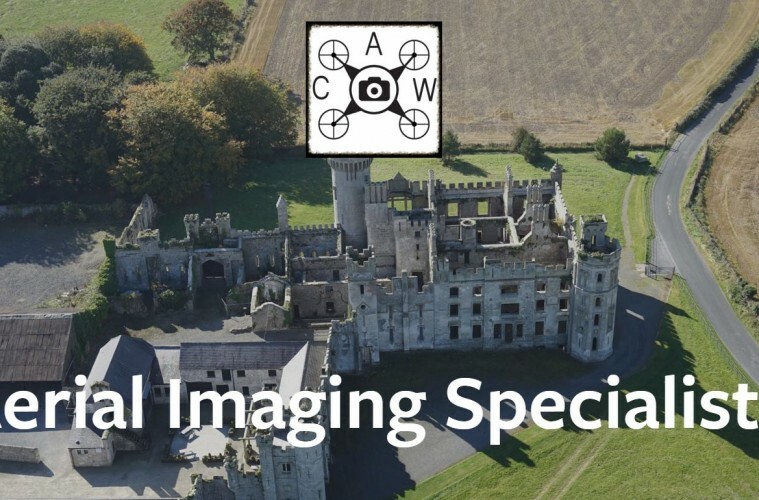 By concentrating on the benefits that our fixed wing aircraft gives us it also pushes us into a different market from the mainstream of the commercial RPAS operators in Ireland, where multirotors are used for photography or cinematography. We do maintain this capability though through our DJI S1000+ system. When using multirotor we always use two operators, by having the pilot concentrating on the aircraft and its surroundings we can ensure the safety of the aircraft and the public, the camera operator can then concentrate on getting the best quality of the imagery. As technology advances the sensors we use will reduce in size and increase in resolution, at present we are using multispectral cameras that capture four wavelengths simultaneously, the next area we would like to see is the development of hyperspectral camera systems for RPAS which greatly increase the sensing capability and scope. Greater battery life would also help in the market with increased flight times for both types of systems. We are based in Newbridge in County Kildare as this gives us the best access to the country through the motorway network. Broadband here is good with our current connection of 60MB download and 20MB upload more than sufficient to cope with the demands of the files produced. Our plan is to remain here for the foreseeable future. The company was launched in November 2014, but we did not start operating until our first RPAS was purchased and we achieved our aerial works permit in April 2015. At present we are just putting the final touches to a collaborative research project with an Irish university that will take place next year. Our service covers a wide section of the market, from farmers and foresters, quarry owners, insurance assessors, environmental impact assessors, utility companies, survey companies and archaeologists. For each of them the use of aerial systems can generate data and images that can be used in a quick and safe manner. Specifics include quarry stockpile monitoring, traditionally carried out by surveyor walking the piles with a GPS device, now this can be carried out safer by flying over the pile and mapping it, no personnel required on the ground and no impact to ongoing operations. Currently our team consist of my wife and I. Responsibility for flying the aircraft falls to myself and my wife operates the camera system or acts as a spotter for the fixed wing aircraft, again ensuring safe operation of the aircraft. In the next 12 months we are looking at achieving our CAA permit for aerial works, allowing us to operate across the whole of the island of Ireland. We are also looking at the possibility of increasing our RPAS fleet with a new multirotor with multispectral capability, while not able to cover the same area as the fixed wing, it will have increased resolution for smaller problem areas. 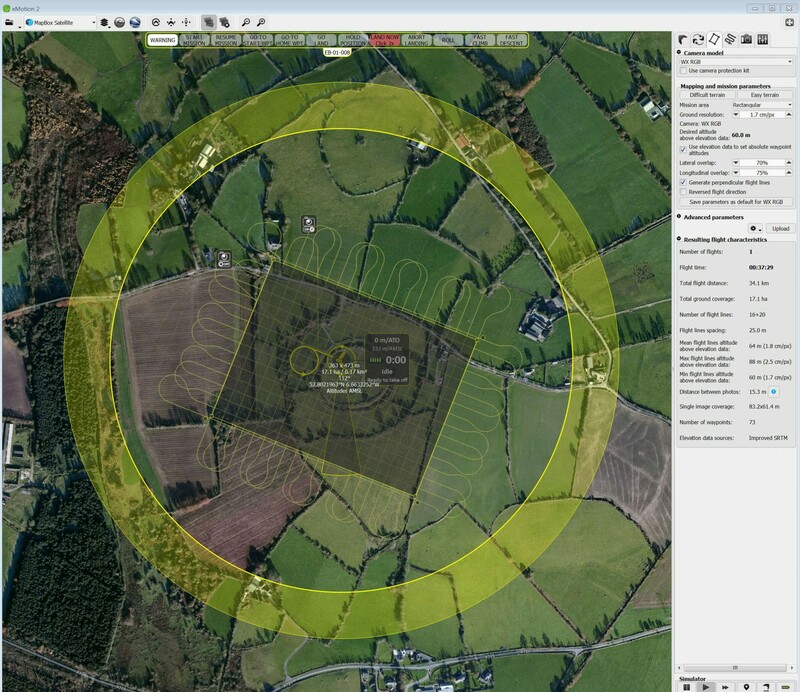 The five-year plan sees the expansion of the business in Ireland to include multiple RPAS and teams carrying out agricultural indexing and surveying, an expansion of the business into the UK market and also looking at the use of hyperspectral cameras over the multispectral systems. First has to be the Sensefly eBee, so much technology packed into a tiny fixed wing RPAS. Second would be the PC built specifically to run Pix4D and GIS software for the business, which also happens to be the perfect specification for gaming in 4K resolution. Finally, the iPhone 6 plus, despite its poor battery life. From a business perspective a 3D printer to visualize some of the models we have produced in Pix4D from either building or quarry surveys. A combination hyperspectral/RGB/thermal imaging sensor for RPAS would benefit us greatly, allowing for multiple scenarios to be completed in a single flight, rather than having to land and switch sensors. From a personal perspective the Glowforge 3D laser printer as it looks such a revolution in the market for usability and functionality, also the Oculus Rift VR for fully immersive 3D experience.